Components are 3D printed in Black (images shown in gray for clarity). 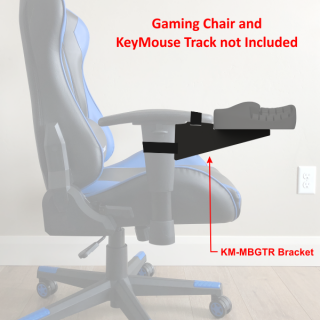 Custom fit to mount KeyMouse Track to GTRacing Gaming Chair without Platforms. Included for each bracket are (2) velcro straps for mounting to chair, (2) replacement bolts for chair armrest, and (4) 10mm screws for mounting bracket to device. It takes approx. 24 hours of 3D print time for each bracket to create these parts at 80% infill. Designed exclusively for this GTRacing Chair model. Brackets works on any color variations of this chair model.